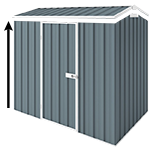 Our best selling Absco Skillion Roof Single Carports are constructed of heavy duty galvanised steel framing with solid RHS steel posts. The majority of the components are pre-punched. Concrete slab attachments and all other fixings are standard. It comes with C1 wind rating as standard and can be upgraded to W50 at check out. Took a bit of work, but best value I could find, when I save up more money, I will buy another carport from Cheapsheds for the car!